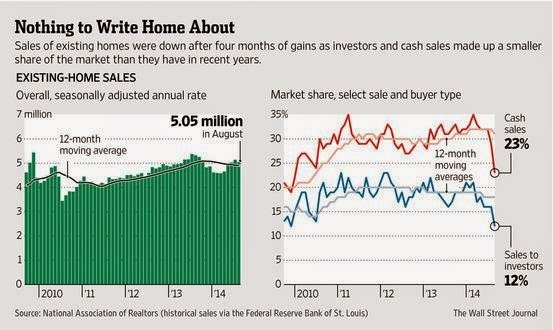 Institutional money continues to retreat from the U.S. residential real estate market. The share of sales to investors has fallen to 12%, down from a recent high of 23% in the 2012 - 2013 investor accumulation period. The chart on the right illustrates this decline, while the chart on the left shows the 12 month moving average in home sales peaked in late 2013. 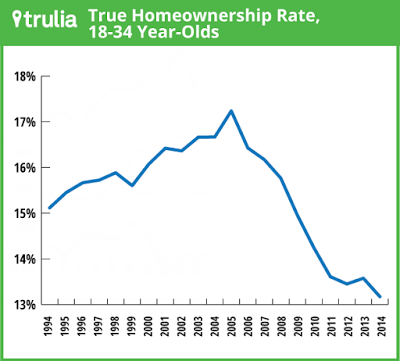 The most bullish argument for the housing market is the "pent up demand" that has accumulated with 18 to 34 year olds still living in their parent's basement will soon become home buyers. 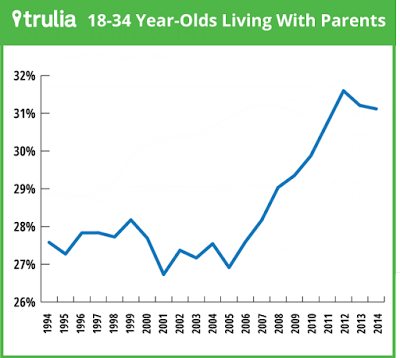 The good news is the number of 18 to 34 year olds living at home looks it may have finally peaked. The bad news is they are not purchasing homes due to lower paying jobs, not enough savings, crushing student loans and an overall distaste for home ownership. Perhaps this will change if the economy continues to improve combined with a reduction in mortgage rates, a loosening of lending qualification standards and a more positive sentiment toward home ownership. 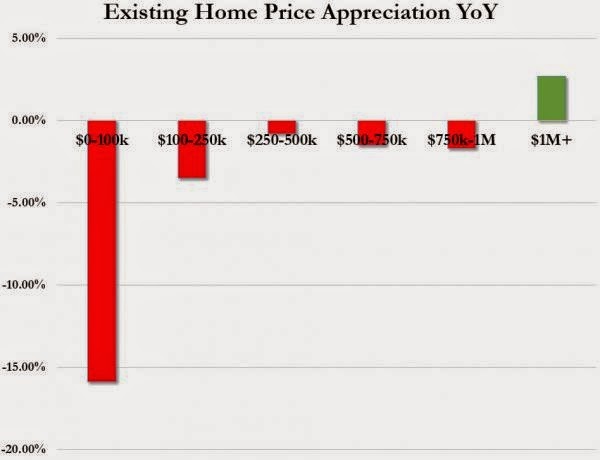 My personal opinion is that all four of those criteria will move in a negative direction for housing in the years ahead (setting up an excellent buying opportunity during the next period of price declines). In the meantime there is only one remaining sector of the market that continues to see price appreciation; the $1 million plus price point. The rich have seen their net worth explode higher due to the most recent paper asset mania, and they spend weekends out bidding each other for the largest possible mansion at the highest possible price. If it makes you feel any better, this portion of the market will experience the greatest losses when the current asset bubble deflates.